My Modifications: I knit 6 extra patterns repeats for a longer scarf. After knitting the recommended 16 pattern repeats, the scarf didn't seem long enough. I perused Ravelry for Alhambra FOs and found that many knitters wished their scarves were longer. I decided just to finish the whole skein of Sea Silk. After blocking it is just over 5 ft. long. I love this color! The Alhambra scarf is being blocked. With that done, and the Vinnland socks waiting for their giftee, that's 2 items checked off the list in as many days. It's a personal record, but only because our son is on a trip this week. I miss him, but I am taking advantage of the extra knitting time. And though I have more UFO's, I'm just not capable of doing all of the finishing work for 2 things in a row without casting on for a new project. There are sweaters in my queue, more gift-sock skeins waiting, as well as some shawls that are calling to me (esp. Citron). But, I'm going to take my own advice and cast on some socks for the current afghans for Afghans Summer of Socks drive. I have this Lorna's Laces sport weight leftover from a baby blanket. I'm thinking about using my favorite Priscilla's Dream Socks pattern, but knitting them toe-up with the method I just learned from knitting Vinnland. I'll let you know how it works out. I'm off to wind yarn. The Vinnland socks have been almost done for 2 whole weeks. I finally realized that some quiet time, interrupted by neither beast nor man, had yet to magically occur. (Even as I typed the last sentence, the phone rang, the cat tried to sit on the computer, and a neighbor knocked on the door!) So this afternoon I barricaded myself in our spare room for an hour. Armed with the computer, some knitting tools, and, of course, some chocolate, I sat down to finish up. My big plan was to learn how to do the "K2P2 Grafted Bind Off" from the pattern, and take photos to share what I learned. It didn't quite work out that way. I began to follow the instructions, and realized that the Grafted Bind Off is very similar to the kitchener stitch. Even though it is a bind off, not a seam, it is just like seaming. You divide the purl stitches and knit stitches onto 2 separate needles and then use a yarn needle to to draw the working yarn through the stitches in a set series of steps. I quickly realized that I was having a hard time maintaining even tension. So, I decided to google "stretchy bind off for ribbing" and was amazed at all the choices that came up. After reading about a number of them, I settled on this one described in a post by Grumperina (scroll down past the 3rd photo to see her bind off instructions). She also included one of my favorite knitting tips: go up one needle size to avoid binding off too tightly. I was a little worried at first that the cuff looks slightly flared, but I don't think it will when the sock is actually being worn. My goal was to finish with a stretchy bind off that still looks tidy, and I am pretty happy with the final product. I am off to wash and block them. Now I just hope they fit! Bullwinkle/Eva, the Out of Yarn blogger, was very nice and knit the socks as a contest prize even though she didn't get to go on the trip to Antarctica. The socks are great. And she even included a gift of sock yarn in the package along with a note apologizing for the socks taking a long time to get here. Totally unnecessary but still much appreciated! It is Socks That Rock lightweight in the "Flower Power" colorway, which is a beautiful combination of colors. First, check out this raffle: The prize is so nice, I wanted to make up new email addresses and enter multiple times. Instead I decided to tell you about it. Go to the Winged Knits blog to read about the prize, then go to the Quince and Co. website to enter. I admit I didn't get very much knitting done during the game. After correcting 3 mistakes, I decided that maybe beer, baseball, and lace knitting didn't mix that well after all. But we did get to watch Tim Lincecum strike out 10 batters. I hope you are having a nice week and maybe even doing a little knitting in public. Well, I'm still waiting for that magical moment to finish the Vinnland Socks. You know, the uninterrupted time, free of distractions, that never seems to arrive? I'm sure it's not difficult to do the grafting, but I want to do it well, as they will be a gift. Soon. Finding myself without an appropriate knitting project, I did what many of us knitters would do when we know we will be sitting around waiting: I cast on for a new project. This is the Alhambra Scarf pattern, by the talented Anne Hanson, of Knitspot. 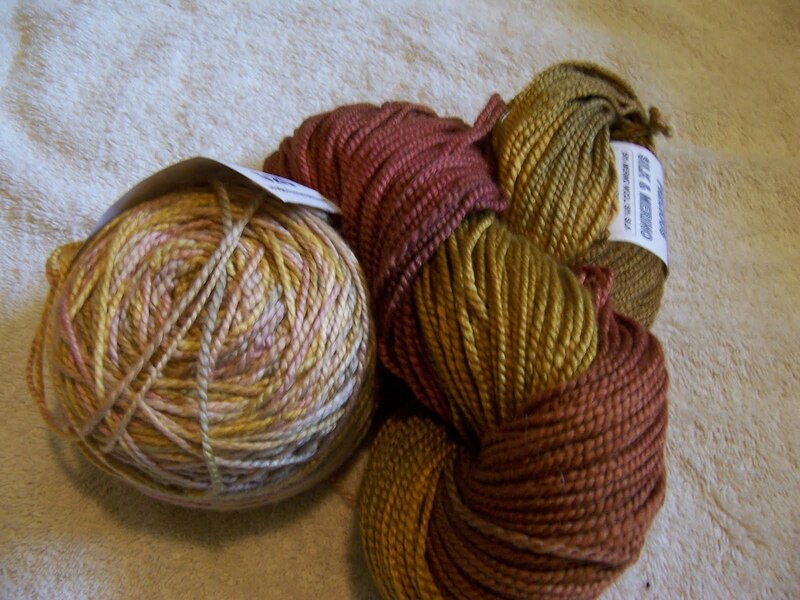 I love the color of scarf pictured on the pattern, so I dug into my stash for this Handmaiden Sea Silk in Pumpkin. I knit away, while checking on the hatching chicks and moving them into a brooder, under a heat lamp, to dry off then they were ready. Soon enough, the little fuzz balls were rested from their ordeal and finding their way around. . . So, the chicks are happy and healthy, and I have a new knitting project! Our son's last day of final exams was a half-day yesterday, so we used the afternoon to do one more check of our porcini and morel spots. The pickings were sparse, probably due to a combination of the weird weather we are having this spring, and other mushroom hunters beating us to the ones that did grow. No matter.... like always, it was more about the hunting, than the finding. It's always good to hike around in the pines with views of snow-covered Mt. Shatsa nearby. We squeezed 2 adults, 2 dogs, and 3 teenagers into the car, so I ended up riding around with the mushroom basket on my lap. Still I used the driving time to finish one Vinnland sock. I haven't done the bind off yet, because Becca Compton included specific instructions for grafting k2, p2 ribbing that I will take more time with when both socks are done. Another new skill.... I'll show you when I get there. I highly recommend this pattern and just might have to make a 2nd pair for myself sometime. Ever since my post about the 10,000 steps program, I've been making an effort to exercise more and eat healthier. After reading about blueberries as a "superfood" I had been talking to my husband about replanting some blueberry bushes. (We used to have a short row of them, but that was before our chickens were fenced in behind our house. The chickens would always find the ripe blueberries before we did, and eventually the bushes died, embarassingly enough, simply from lack of care.) To my surprise my family added 8 bushes to our garden as a Mother's Day gift to me. It's the Pinwheel Fruit Tart from The Silver Palate Cookbook. It's basically a big, buttery, shortbread cookie topped with pastry cream and fruit. I substituted whole wheat flour for the white flour, and used skim milk to make the pastry cream. But still, I think the health benefits of the berries and cherries were cancelled out by the butter, sugar, and egg yolks. Still, I had a slice for breakfast, before knitting away on the Vinnland socks on this lazy Sunday. The bushes seem healthy enough despite our refusal to follow instructions, and at least the chickens aren't getting the berries this year. I wonder how many calories I'm burning while knitting socks? During the last 6 yrs. of my knitting adventures, I've knit projects for myself (of course). I've knit for family members, and for friends. I've knit hats and sweaters for charity. I've knit baby gifts. I've even knit items and sold them. Some of the items I've made, for myself and others, have been well-received and well-loved; others. . . not so much. This year, I've fixated on a sure-fire way of getting more satisfaction out of my gift-knitting time. I am knitting socks for other knitters. It actually started last Fall, while traveling through the Bay Area, I fortuitously stopped by the friendly yarn store K2Tog. I say fortuitously, because my visit coincided with the arrival of a gloriously large shipment of Malabrigo. After fondling the gorgeous piles of the stuff, I limited myself to 2 skeins of Malabrigo Sock yarn. Once I got home from the trip, I realized, as much as I loved the yarn, I already had many pairs of hand-knit socks. On the other hand, a knitting friend whose birthday was imminent, had yet to knit herself a pair. From there, it was a no-brainer, and this is where the 2 skeins of Malabrigo Sock ultimately went. At this point, the element of surprise is gone, so I'm asking the rest of my little circle of knitting friends to choose their own sock yarn and patterns. Which brings me to my current WIP. A friend who met up with us at Stitches West chose Miss Babs "Bamboo Baby" Superwash Sock & Baby Yarn, in the color Grapitude, and settled on the Vinnland (Rav link) pattern by Becca Compton. So far, I'm really enjoying knitting these up. The color is beautiful, and the pattern is cleverly written. I've turned the heel on both socks, and they'll be done before my next visit with their recipient, which means my other knitting friends might want to be thinking about which pattern they might like to have on their feet in a few months. Only a few hours later, we heard hooting, and spotted a huge Great Horned Owl in the top of a tall pine tree in our front yard. We decided the owls approve of the new nicknames. Meanwhile, our locally famous Bald Eagles have done it again, by successfully raising 3 chicks despite the bridge construction going on near their nesting site. The eaglets can be seen during daylight hours via the solar-powered web cam put in place prior to the start of the construction. Recently, the eagles were provided a modicum of privacy courtesy of spiders who constructed cobwebs across the camera lens, but the eaglets can still be seen testing their wings around the edge of the nest. P.S. Twice now, I accidently typed "y-a-r-n" instead of "y-a-r-d" while describing our owl visits. I think it's a sign that I need to get back to knitting content. Tomorrow I will write about my current "yarn" project. How gratifying to check back here after my first new post in a long while, and see comments! I love hearing from you. I plan on answering The Student Knitter's knitting question in a minute, but first I have to tell you about the mushroom hunting that has been cutting into my knitting time. How many morel mushrooms can you see? Over the last month, 3 of my 4 regular knitting nights were usurped when my husband's mushroom hunting buddies came to town. (Not that I mind. Besides being fellow foodies, they are charming and funny. One of them is a wonderful chef, and one of them even knits!) Still, it is only fair that this past weekend, the roles were reversed, and my husband and I took some of my knitting friends into the forest on a morel mushroom foray. The morels grow in the spring the year after a pine forest fire, so while hunting you get a first-hand view of the past devastation, as well as the new growth. One knitting friend, who joined in, has started her own nature blog. If you are interested you can read more about our day here. So, first off I'll answer the question about the scarf pictured in my last post. It's just as well to start there, as the Chevron Scarf was my first FO in chronological order since I was posting here regularly. The Student Knitter wanted to know if I used 2 different yarns to make the stripes. The answer is... yes, and no. The fantastic thing about this handpainted yarn from Coloratura, is that every colorway is produced in both a "Pastel" and a "Rich" version. 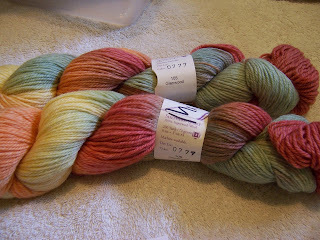 A couple of years ago at Stitches West, I bought both a light and a dark skein of the Cosi Fan Tutte colorway, because I couldn't decide which one I preferred for a sweater I had in mind. The sweater never came about, but the yarn seemed like a perfect choice when I decided to knit the Chevron Scarf. As you can see from the 2,270+ versions of the scarf on Ravelry, most knitters use a variegated sock yarn to create the stripe effect. But I've been wanting to knit something like Brooklyn Tweed's Noro Striped Scarf. So this was a perfect opportunity to combine the 2 patterns while destashing. When I first started knitting, the greens and golds in the yarn were jumping out at me, and I started to worry that my scarf would end up coordinating with 1970's kitchen decor. But, now that it's done, the roses and pinks stand out, and I do love it.